The earliest of the Beech partnerships was recorded at Burslem in 1851, when Beech Hancock & Co started production at the Swan Banks Works in Burslem. With an apparent break in 1856 the next partnership again with Hancock reappeared in Tunstall operating from the Church Banks Works which they had taken over from R. Beswick. Another move 5 years later came when they occupied the Swan Banks Works in Tunstall vacated by the newly formed E.Wedgwood & Co in 1862. 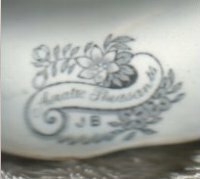 The Hancock partnership ended in 1876 and the firm continued to trade as James Beech until 1889 when the works were taken over by Boulton, Machin & Tennant. With the move to the Swan Bank Works at Tunstall the firm adopted a Swan device which they incorporated into many of their marks, the practise continued at the works up to 1899. 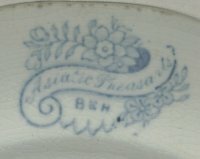 "Asiatic Pheasants" wares are recorded in each of the Beech partnerships with a change of mark for each.